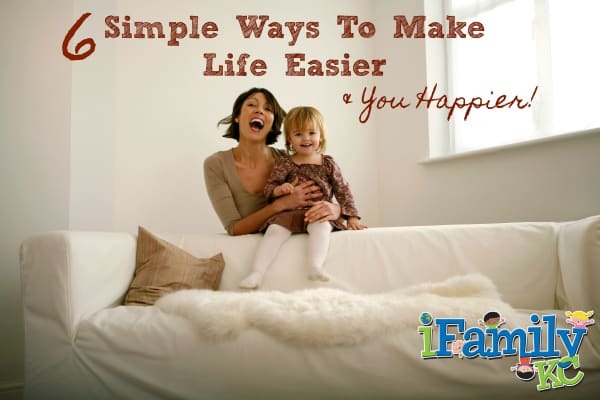 6 Simple Ways to Make Life Easier – And You Happier! I am constantly looking for ways to make my families’ life run smoother. And from my recent round of Facebook stalking, I can see that everyone else could benefit from this as well. And what a great time to start getting in these habits—summer! So when school starts up again you are ready to go! I have tried all the Pinterest posts about posting a calendar for the family, running a chore chart, and organizing to your schedule but something always happens—one of the kids spills something on her dress which sends us all into a code 10 freak out mode or the dog chews up my razor and I can’t seem to find the other two blades which means a code 10 call to the vet. Whatever the issue our best laid plans don’t always go on schedule, so I am sharing with you just a few tips and tricks that I have found helpful. Will these all work for you? No. Will you be able to use all of them? Probably not. But hopefully adding a few things will create just a few more minutes and feel free to use those minutes for you. Cleaning the dog slobber off your black dress pants or something! Or as I like to call it Sunday-Plan Day, this usually means an hour or so planning out the week. My family did well at this for a little while, then we stopped, then we went back to a few things. Basically when it all works we can organize several things in this hour: we plan the weekly meals, pickup schedules, clothes, and after work/school activities. It basically gets my husband and I on the same page so we aren’t making the 4:45 in the afternoon call as to whether or not you can pick up the girls. If you buy for the week you know that everything is defrosted and in the fridge instead of the moment of panic when you realize you forgot to take the chicken out of the freezer! It can also save a lot of money too; when you realize said chicken is not defrosted then you won’t spend additional money going through the drive thru on the way home! Everyone who knows me knows that I am huge proponent of the online grocery and pickup or delivery service. I can still find the best price and I trust the associates at my store to pick out the freshest items on my list. It makes me so happy that I don’t have to spend my weekend at ten grocery stores or drag the kids to the store only to strategically plan not to go near the candy or toy aisle. And you purchase right from your meal list no more and no less! I personally can’t do this. I am what you can call an emotional dresser. I wake up and then decide what I want to wear; I get anxiety if I plan what to wear and then it doesn’t look right or it is just one of those days that black looks better! But for my girls I can still do this! I have learned to let them help with this planning, for anyone that asks it’s such a good learning tool to help them learn organization, days of the week, weather—but really? I can’t do the code 10 freak out when one is wearing a dress and the other wants to wear one too but that is not in their Monday box. Invest in 5 small plastic shoe boxes and a label maker and get to planning—make sure to include underwear and socks too! I am not the expert in financial planning. My husband and I have an “awkward financial discussion” about every month. So I refuse to give you tips on what works or what you can do. I will say that right along with that Sunday Plan Day is a Money Date. Communication and discussion about upcoming debits to the finances can save on many “AFDs” and this will help work into your budget as well. On our money date we look at the month, look at the budget and then always communicate in a non-judgmental and supportive way. We also take a look at last month and see where we need to improve. We can also look at any extra monies we may have coming in or going out. I also may have an addiction to online shopping. Confession—there have been some months that packages have shown up on our door and I couldn’t tell you what they were! First of all take all those apps off your phone and disconnect the one touch buy on Amazon! When you have something that you just aren’t sure would fit into the budget this month and could be considered frivolous go ahead and add it to your cart but wait 48 hours before you click “buy”. If in that time you still feel like you need this then buy; most of the time though that 48 hours puts some perspective on if you really need the patriotic pillow covers! 5. Time Is Never On Our Side! I am not one for clocks; I have never really been a fan of having them and especially not in the bathroom. I find myself checking everything and then hurrying and causing more chaos than it is worth. However, when my girls get up in the morning and are waiting for me to get ready I turn on a show for them, don’t judge me! Have you ever put mascara on while one is going in and out of your legs and keeps turning on the water in the bathtub to give the dog a drink? That morning I only put mascara on one eye—everyone at work thought I had pink eye! In any case I always put on a 30 minute show which means that I can time myself without having the use of a clock. Another tip along this same vein is creating a playlist for the time that you want to spend getting ready; once that playlist is running down you should be dancing out the door! Such a bad word in this day and age, maybe delegation sits a little easier. It is okay to ask for help. A mantra that I am trying to learn myself but relying on your village to help with little things around the house or picking up something you forgot on your online grocery list is perfectly okay. Summer is the worst for things like this; even though it is summer break we are almost busier on weekends and in the evenings than we ever were when school was in session. My girls’ birthdays are both in the summer and from previous blog posts I am sure that you know I don’t go small when it comes to birthdays so planning and preparing for these starts in May. Right now I have my mom tying together silverware packets! Something that isn’t much but would have taken more time than needed to when I could be focusing on other things. Previous story Donating Blood? What You Need To Know Before You Go!